Height 5 ft 8 in. Weight 142 lb. Chest 35-38 in. Complexion fair. Eyes blue. Hair fair. Sight, hearing, colour-vision, heart & lungs normal. Limbs, chest well formed. Full movemnet of joints. Teeth in fair condition. Free from hernia, varicocele, varicose veins, haemorrhoids, inveterate or contagious skin disease. Vaccinated. Good bodily & mental health. No slight defects.Mole between index & middle finger of right hand Fit. Hubert Arthur HAMILTON was the second son of the Rev. Canon Staples HAMILTON and his first wife, the late Rose Margaret nee WYLDE. He was born at Leeston and educated at the Geraldine High School. On leaving school he joined the Geraldine branch of the Post Office, and was subsequently transferred to the Telegraph Department in Wellington. In Wellington he moved to the Bank of New South Wales, with which he was transferred to Ashburton. His brother Gordon Cuthbert HAMILTON and a half-brother Hugh Staples HAMILTON also served in WWI. In September 1914 he completed a Short Course in Naval Signalling, in which he obtained a fair knowledge. He also passed instruction in Sergeants and 2nd class Signallers classes of instruction. In fact, Hubert was a signaller on the troopship Athenic on the way to Egypt. He was also a crack rifle shot. Hubert received a commission. His Parchment Commission was delivered to his father in June 1917, which must have been a cause for both pride and sorrow. 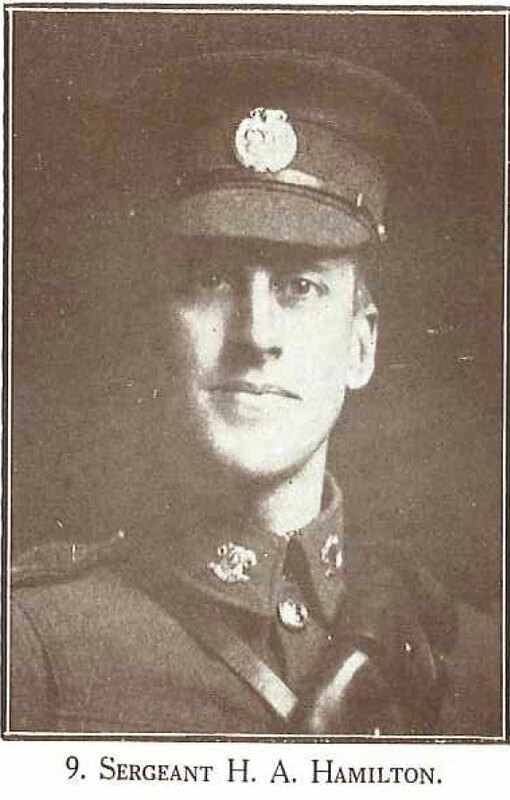 On 20 August 1915 he was to be 2nd Lieutenant and was appointed Signalling Officer (N. Z. Gazette No. 143, 16th December 1915). Hubert enlisted as a fit young man, eager for advancement, and was among some of the earliest to leave for the Front, only to lose his life in the following year at the Dardanelles. Only a month before his death, his father receved a letter from Hubert in which he describes in some detail the current role of his regiment - having a rest from the trenches, living in bivies only twenty yards behind the actual front,and shells bursting close by (here he mentions how Hamilton Elmslie, another Geraldine man, was wounded), and how after a quiet time, 'things livened up a bit, and shot and shell flew thick.' He refers to the din during a service conducted on the previous Sunday morning; and to some fierce hand-to-hand fighting, with hand grenades. In conclusion, he writes 'It's lots better than the Moving Pictures to sit outside my bivey and watch the enemy's shrapnel bursting over and in the sea.' A short time later this Moving Picture scenario was no longer for Hubert. He was killed in action in The August Offensive, in which he was a leader. He was determined to break the stale mate by outflanking the Turks with a landing at Suvia Bay further to the north. To hold the enemy's attention, he attacked at Cape Helles on August 6, sending 26,000 British men and 13.000 French soldiers against 40,000 Turks. British losses on the first day numbered 3,480; the Turks lost 7,510. By August 22 Allied troops losses surpassed 6,000 - among them Hubert Arthur HAMILTON.